There are a myriad of transport options that enable the visitor to explore the City of Light in its entirety. While much of Paris’s famed beauty is found in her walkable central arrondissements – best appreciated, intimately, on foot – bicycles, boats, car rental, scooters and Segways are available to those who want to explore the city’s fabric further. Upon arrival in Paris you should pick up a free metro guide from any metro information booth. Alternatively, you could download a free app to your iPhone. 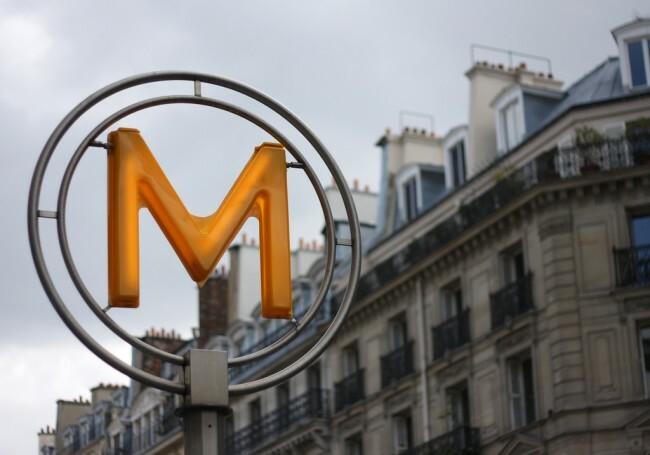 The Paris subway system is very efficient and cheaper than alternatives in other European capitals, however, it is recommended that you avoid using it during rush hour. For those staying in the city for longer than a night and and keen to explore swathes of Paris; the Paris Visite Pass might be your cheapest option. Unlike the individual metro tickets the pass enables you to enjoy unlimited travel in the capital (metro, bus, RER, tram and regional SNCF trains) and also entitles you to discounts at several museums and restaurants.A one-day pass valid in Zones 1-3 is currently 12 euros, although this price decreases with the number of days you commit to. Marin D’eau Douce is a rental service for electric boats in central Paris. You do not need a license and you can hire the boats for anything from a few hours to a complete day. 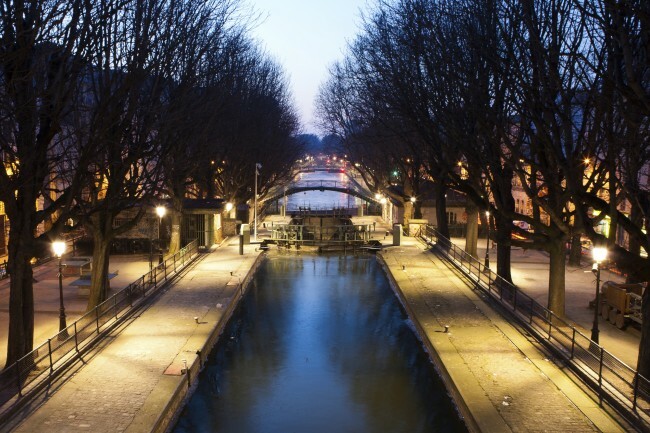 The service provides access to ‘40 kms (64 miles) of waterways on the Canal Saint Martin, the Canal de l’Ourcq and the Bassin de la Villette’. These picturesque canals are where Parisians spend their leisure time, either at the water’s edge or congregating at one of the many picturesque bridges. Navigating the waterways is a fantastic way to gain a new viewpoint from which to experience the city. Velib’ is the Parisian public bicycle sharing scheme that has since found similar success in other European cities. Initially set-up by Paris’s former mayor Bertrand Delonie, following the success of a similar scheme in Lyon, there are now 19,000 bicycles spread over 1,200 docking stations. 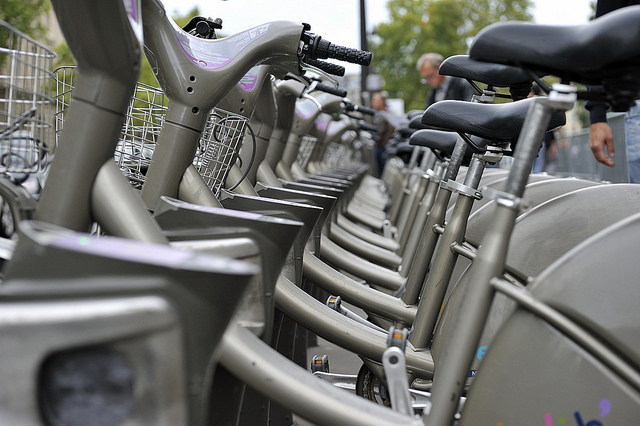 With roughly one docking station every 300m, the Velib system is the third most extensive in the world. There are a variety of rental packages and cars can be rented for as little 30-minutes for between €4 to €8. 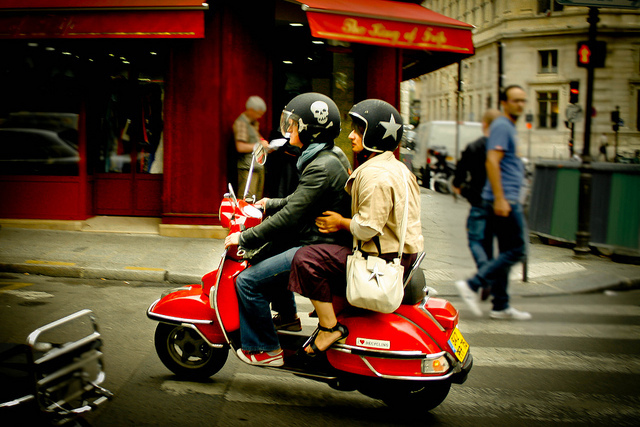 For those of us more accustomed to the grey, wet streets of London; the idea of hiring a scooter and exploring Paris from the seat of a Vespa sounds exotically European. Paris by Scooter offers rentals and custom or tailor-made trips through Paris and to Versailles. The usual rental period of a scooter is 24 hours, however the price decreases as the number of days increase. The company will arrange for the scooter to be dropped off at your hotel or apartment and will also pick up the scooter once your rental period has expired. Paris by Scooter is a wonderful way to avoid the crowds on the metro and will also enable you to search and find your own Parisian secrets. 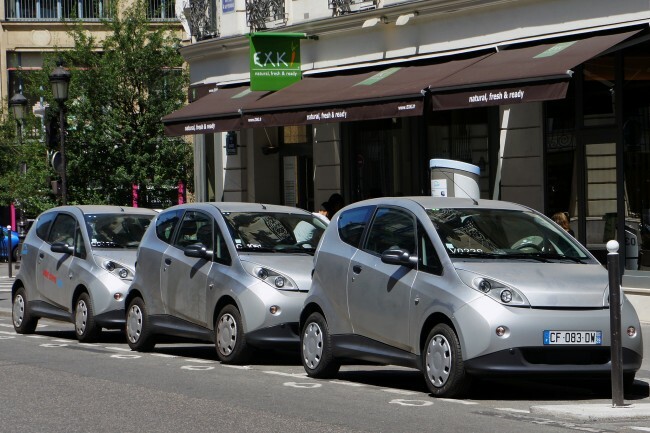 Autolib’ is the spawn of Velib’s success in the French capital. There are currently 2,500 all-electric Bollore Blue Cars available on a subscription service, with over 4,000 electric car charging points dotted throughout the city, The Autolib’ Blue Car is available to anyone older than the age of 18 and in possession of a valid French driving license, or a valid foreign driving license with the additional international driving license add-on. Cars can be collected from any rental station and returned to any rental station, and the battery lasts for up to 250km fully-charged. 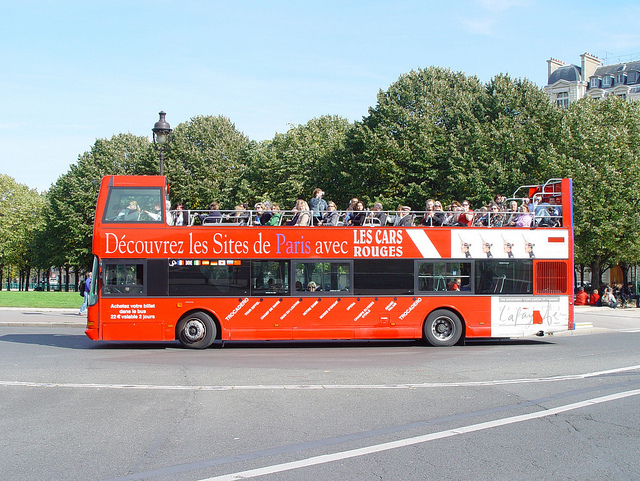 This hop on, hop off Paris bus tour serves nine of Paris’s key attractions on a 2 hour and 15 minute tour of the city. Audio commentary – available in eight languages – and good views of the city can be enjoyed from the open top deck. Tickets bought cover the tour for two full-days, so it is easy to use the service over the course of a weekend. Notable exceptions on the tour are Montmartre and the Latin Quarter, but both of these can be easily reached by public transport. 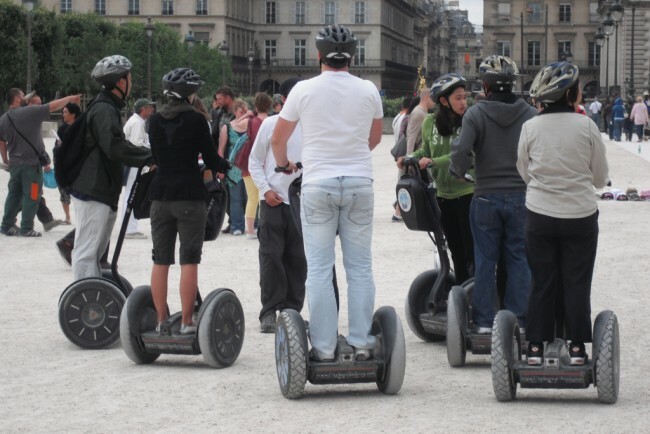 The Paris Day Segway Tour is another intimate way of traveling around the city and seeing the best of Paris’s sights. The tour lasts for approximately three hours in high season and incorporates many of Paris’s famous attractions and beautiful parks. For those new to the Segway, the tour guides are both patient and informative, teaching you how to balance and offering words of encouragement to dispel any nerves. The price of the tour is €95 euros for an adult/student ticket. The shorter winter tours which last only 2 hours are €75 euros.